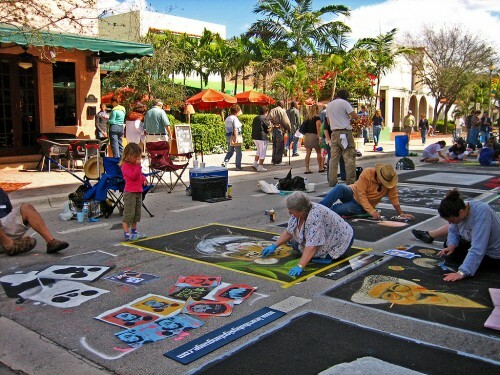 The 2014 Columbus Arts Festival will feature exciting works of Street Chalk Painting and is seeking artists to participate on June 6, 7 and 8. The work presented must fit in a 4 x 8 ft. concrete space and must be completed by Saturday evening, June 7. 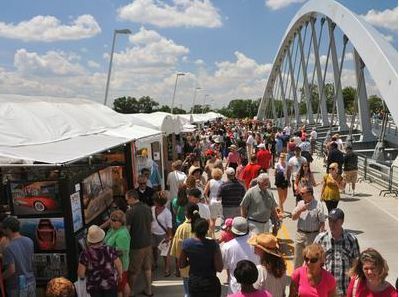 The works will be reviewed by a jury on Sunday, June 8, and the winner will be awarded a cash prize. 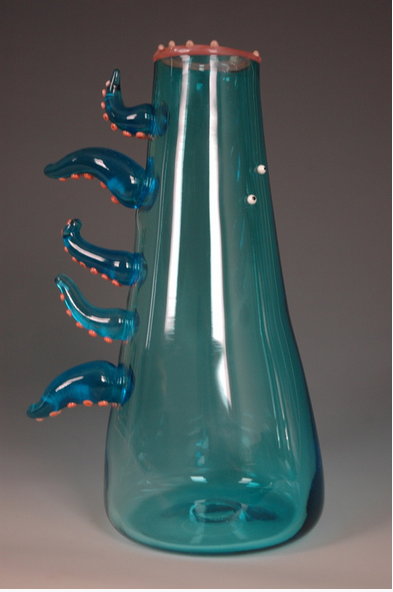 Every last Saturday of the month Glass Axis presents free demonstrations. In March, we feature Emlyn Strzempka and her current body of work ‘Looking for Love in All Wrong Places’. Watch Emlyn take her sketches and drawings, and brings them to life through glass! This will be the LAST FREE demo! Check out this artists spunky and carefree characters and sculptures as each piece has been part of a coping mechanism for her love life throughout her ’20 something’ stage of life. The graphic and blatant subject matter tells the story of loves lost in different situations, but expressed from an animalistic point of view. “I see myself as one of these silly creatures, getting caught up in yet another frivolous yet heart-breaking relationship.” says Emlyn. Emlyn started blowing glass in 2010 at Bowling Green State University, where she later graduated with her BFA in glass and metal smithing. In 2013, she was offered the technician apprenticeship at the Pittsburgh Glass Center, where she really began developing her hot sculpting aesthetic. She currently works at the Glass Center as an instructor. Her work has been exhibited throughout the Middle West, including the Toledo Museum of Art. 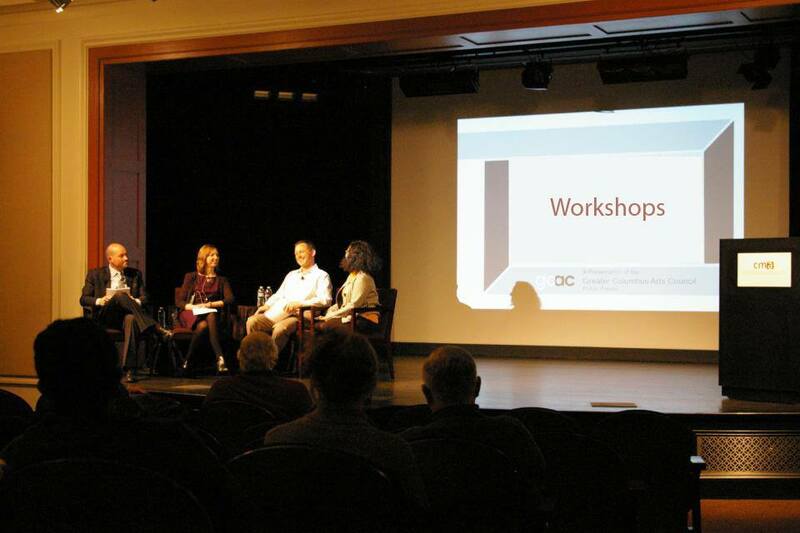 The Ohio Art League is hosting a series of 7 workshops for best practices for artists, professional and emerging. These workshops will cover everything an artist needs to know about presenting themselves professionally. Participants will learn what it means to be ‘professional’ as an artist, how to photograph your artwork, framing and hanging of your works, what it means to be submission ready, CV and Resume writing, social media platforms and how to use them, and more! Workshops are held the second Saturday of each month. Each month’s workshop will focus on a different subject. So you do not have to attend all, each session is individual from the others. As an artist it is important to have good quality photos of your work. This workshop will cover how to document your artwork through photography. This will be a hands on lecture, where you will learn how to properly light, frame, and photograph your artwork for submissions and documentation. *It is encouraged that you bring your own camera that you plan to use. Maria DiFranco is currently a Graduate Teaching Associate and MFA Candidate at The Ohio State University in Columbus, Ohio. DiFranco grew up in Westlake Ohio, a suburb of Cleveland. Always having an interest in History and Art. DiFranco attended Rhode Island School of Design for her undergraduate degree where she earned a BFA in Printmaking. Maria continued to live in Providence, Rhode Island for the next several years teaching and exhibiting her artwork. 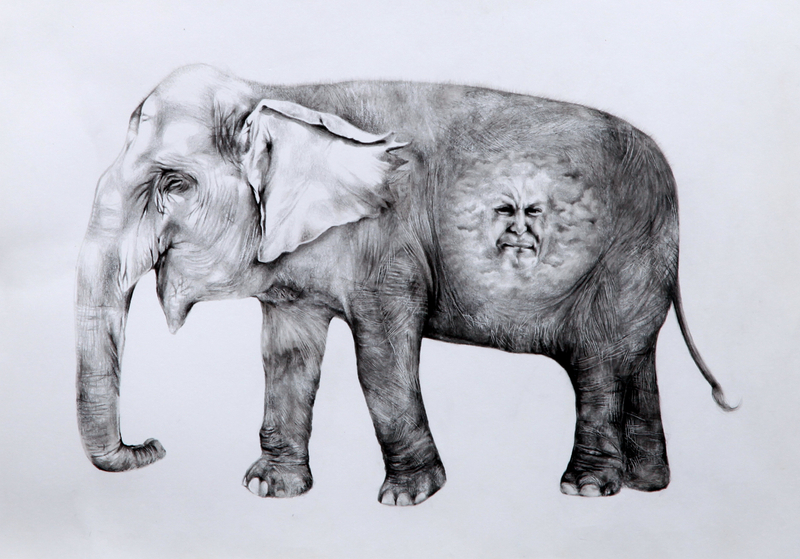 During this time DiFranco was awarded second place in the Fidelity Investments juried exhibition Growth, third place in the National Society of Arts and Letters Printmaking Competition New York Chapter, and was named a finalist in the Rhode Island School of Design Printmaking Competition. Recently Maria has been very busy not only with school, but with showcasing her artwork. Maria was one of five chosen artists form ROY G BIV Gallery to hang murals around the Short North Arts District in February. She has a upcoming exhibition opening April 4th in Cleveland, Ohio called ‘Vacancy/No Vacancy’ and a MCE exhibition with Ohio Art League mid year. While Maria awaits her opening MCE at Ohio Art League, she has been selected as a OAL’s first ‘Featured Artist’ and you can view her online exhibition below! 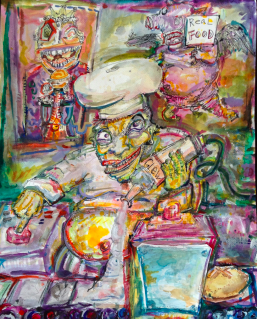 Kyle Boganwright’s use of draughtsmanship interspersed with a mixture of watercolor illustrate various professionals in a not-so-flattering light in his upcoming exhibit, “Professional Mis-conduct!” This Columbus artist displays the distress and distaste behind a slew of positions in professional fields via facial expressions, aggressive color choices, and his dry sense of humor. 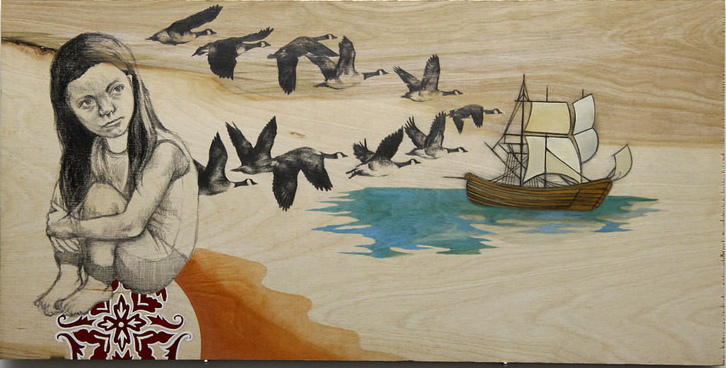 Get a first-hand glimpse of this exhibit during the Artist Reception this Friday, March 28, at R.A.W. Gallery in Columbus from 6-9 p.m. R.A.W. Gallery, an upcoming must-see for any gallery aficionado, is located at 112 E. Main Street, Columbus, Ohio 43215. Visit RAW Gallery’s Facebook Page for details! The Orange County Center for Contemporary Art (OCCCA) and the Vietnamese American Arts & Letter Association (VAALA) invites creatives of all kinds to submit art for exhibition in HOME, curated by artist/curator Richard Turner. The word “HOME” resonates on cultural, emotional, intellectual, religious, philosophical, political and spiritual levels-as a place, a space, a myth, a source of identity, a promised land, a state of being, a war zone, an impossibility, and/or an inalienable right. This simple word is open to a wide variety of interpretations. HOME can connote security, belonging, memory, and comfort, or arouse feelings of dread, alienation, and pain. HOME informs and is informed by geography and history, identities and ideologies, imagined and lived experiences. Artworks may explore what it means to create a HOME or to be without a HOME, what happens when we leave HOME and arrive in a new place, or how relationships with culture, history, emotion, religion, philosophy, politics, and spirituality affect the idea of HOME. The goal of this exhibition is to illuminate and enrich our understanding of the concept of “HOME” through artworks that critically explore the concept and also allow us to see various interpretations from different cultural standpoints. Are you interested in learning more about eliminating barriers to the art-making process, adaptive materials, and how to work with people with disabilities? This is a workshop you won’t want to miss! Join some very talented individuals and hear them speak at this engaging workshop! When: Tuesday April 1st 9:00 a.m. – 3:00 p.m.
A tentative schedule for the workshop can be found below. United Way of Central Ohio is hosting a grant writing series has been modified to provide additional tools for experienced and aspiring grant writers. Participants will find these comprehensive classes provide everything they need to know to write successful proposals. Participants learn the fundamental components and strategies for effective grant development in order to write successful grants for neighborhood, grassroots, or community organizations. Facilitator: Josh Summer, Director of Development at the Ohio Association of Community Action Agencies. As an individual, some artists may think that they are not eligible for grants or support, but GCAC’s ‘Artists in the Community’ shows artists that that is not the case. Many organizations, like GCAC, provide grant opportunities to individual artists in the Franklin County area. “Artists in the Community” is GCAC’s grants and services program designed to support individual artists in Franklin County. Fellowships, supply grants and much more. Join Ruby Harper, Grants & Services Director in this informative session where she will de-mystify GCAC’s application process and provide some one-on-one consultation in an informal environment. 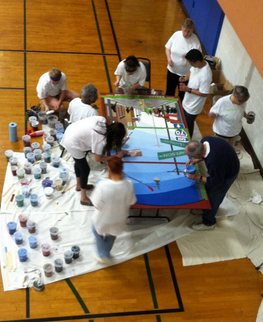 The Harmony Project and the OAL have partnered up to create a mural for the “One Week One Neighborhood” event. This mural will be placed on the side of the Boys and Girls Club in Franklinton at the corner of Gift and Chapel. Two OAL member artists will be selected to work with the Harmony Project’s Jeremy Jarvis to establish a family friendly mural that depicts the spirit of the neighborhood. The mural will be constructed as “paint by numbers” to join not only the ideals of the community, but also define the importance of unity and a little elbow grease. If you’re interested, please contact Esther Hall by April 5 for further information and to email samples or links of your work for consideration.